Musée Héritage Museum: Holiday Programs at the Museum! Staying home over the holidays? Come to the museum to help us ring in the new year with our NEW holiday drop-in programs with a suggested donation of $2 per participant. Programs will take place at the Musée Héritage Museum in St. Albert Place Monday Dec. 29, Tuesday Dec. 30 and Wednesday Dec. 31-- check out the details below! 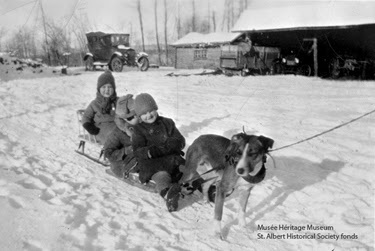 We will be open Monday, December 29 for our “Winter Landscapes” program, discovering how people lived (and travelled) in the early settlement of St. Albert, throughout the long winter months. We will look closely at real historical objects, and make some winter landscape crafts. Program times: 10 AM and 1 PM (for one hour). On Tuesday, December 30 come learn about “New Year’s Around the World,” through stories, a fun game, and a celebratory craft. On Wednesday, December 31 we will have a New Year’s Celebration from 10 AM-12 PM (drop-in), with snacks, drinks, and crafts to get you ready for the New Year’s Eve.